Here’s why Conor McGregor is going to beat Floyd Mayweather Saturday night in Las Vegas. 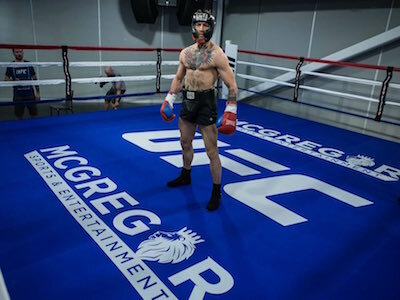 New footage has been released of Conor’s sparring session with former boxing world champ Paulie Maligaggi and the Irishman is really taking it to him. In this new video from MindSmash they break down how Conor’s karate stance approach and ability to fight ambidextrous is quite effective against the traditional boxing stance and how Conor’s ability to cover distance so quickly could be the deciding factor when he faces boxing’s finest in Mayweather. Conor recently talked about this strategy. Look, I know this is crazy. It’s unorthodox. But when you look at all the factors of what is playing out, and those in MMA circles know what Conor has already accomplished… This whole thing may just turn out to be the ultimate triumph of MMA over boxing when Conor knocks out their biggest star. It’s not going to happen right? This is all just some weird dream in the mind of Dana White after a three-day bender… right? What Can Conor McGregor Bring to the Table Against Floyd Mayweather?